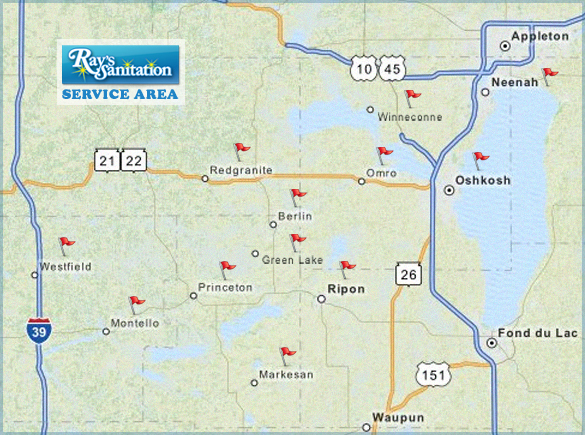 Ray’s Sanitation provides porta potty rentals to many counties in Wisconsin. Please refer to the map & list of cities for general coverage. WE SERVICE: Berlin . Dale . Dalton . El Dorado . Green Lake . Kingston . Larsen . Markesan . Menasha . Montello . Neenah . Neshkoro . Omro . Oshkosh . Poysippi . Princeton . Red Granite . Ripon . Rosendale . Westfield . Winchester and Winneconne. We are always willing to discuss special deliveries to an area not listed here.